Philanthropist and Anglican layman Robert Raikes was born in Gloucester in 1736, and is best known for establishing the Sunday School Movement. He became proprietor of the Gloucester Journal in 1757, having inherited the business from his father. Raikes realised that crime was connected to social status and lack of education, and this realisation led him to develop the idea of the Sunday school. The first school, opened in 1780, was designed to provide children with the chance to learn to read at a time when most worked six days a week. He used the Gloucester Journal to promote the idea in an article written in 1783. The article helped to popularise the concept, and within 20 years of his death in 1811, around one and a quarter million children were regular attendees. In 1880, a statue of Raikes was erected on the Victoria Embankment in London to celebrate the centenary of the Sunday School Movement. 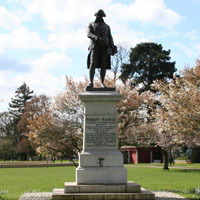 A copy of the sculpture – which was created by Sir Thomas Brock RA – was erected in Gloucester Park 50 years later, in 1930. View more Gloucester Civic Trust achievements or discover how GCT restored historic gardens and creating new urban gardens to regenerate local neighbourhoods.